Whether it’s the body of an email message that’s been forwarded too many times, or content you’ve copied from a PDF, sometimes you find yourself with messy content—text that has lots of odd characters and stray line breaks, for example—and you need to make it presentable. Previous Gem TextSoap is perhaps the best of text-cleaning utilities for Mac, but if you don’t need all of TextSoap’s features and capabilities, Clean Text (Mac App Store link) does an admirable job for only $10. You can use Clean Text’s features in a few ways. The first is to simply paste your messy text into the Clean Text window. You can then click any of the program’s 35 preconfigured modifications, listed to the right, to perform that action on your text. The options are organized by type: Fix (reflowing paragraphs, removing quote characters, removing stray characters, converting tabs to multiple spaces and vice versa, and more), Transform (for example, converting simple punctuation to “smart” equivalents and vice versa, sorting lines, removing duplicate lines), Change Case, Convert (changing line-ending encodings, converting period runs to elipses, stripping non-ASCII characters), Reverse (to reverse text at various levels), and Fun (making text flow backward or upside down). There’s also a Quick Clean option that performs the most-common cleanup tasks with one click. Apimac claims the Convert category includes an action to create ligatures for fi and fl, as well as to convert ligatures to their component letters. However, these actions weren’t available in my testing. The Clean Text window provides a number of other ways to fix your text. There’s a traditional find-and-replace dialog, but click the Replace button on the right, and you get a tool for performing up to three find-and-replace tasks in one sweep. Whichever method you use, you can search by full word, ignore case, and even use regular expressions. You can also quickly add the date or time to your text, and a Statistics button reveals a separate window that displays basic stats about your text: character, word, space, and line counts; estimated reading time; word frequency; and more. The second way to use Clean Text is to select text in any application that supports OS X services and then choose Application Name -> Services -> Clean Selection With Clean Text, which uses the Fix All feature on that text, immediately replacing it with the resulting cleaned text. Alternatively, choosing New Clean Text Window With Selection opens a new Clean Text window and pastes the selected text for cleaning. As with any service, you can use the Keyboard pane of System Preferences to create a keyboard shortcut for each of these actions. Finally, Clean Text offers a couple ways to use the Fix All cleaner on the contents of the clipboard without having to paste it anywhere first. One is to click the Fix Clipboard button in the Clean Text toolbar. But more convenient is that if you click the Iconize button in the main Clean Text window, you get a tiny palette that floats above other windows. Click Fix Clipboard Text and Clean Text does just that—you can then paste the cleaned text into any app. 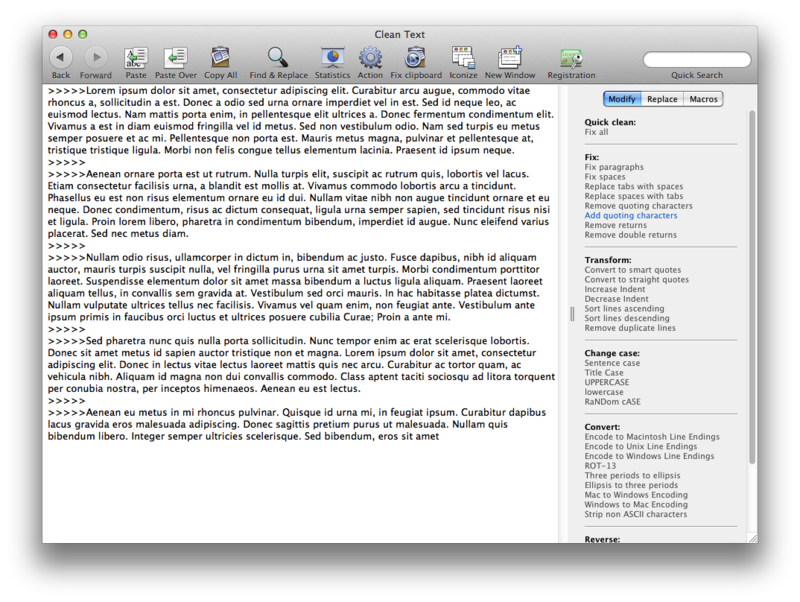 There’s also a handy Strip Clipboard Style option that strips all formatting from the clipboard. If you find your yourself performing the same cleaning sequences over and over, you can create one-click macros for processing text. Click Macros on the right, and then click Edit under the appropriate item: Text Modifying to use any combination of Clean Text’s built-in cleaners, or Text Replacing to use Clean Text’s find-and-replace options. In the resulting dialog box, click Add to create a new macro (or Duplicate to base your new macro on an existing one), give your macro a name, and then add as many cleaners or find-and-replace actions, respectively, as needed. When you’re done, click OK, and your new macro appears in the Clean Text sidebar under Macros. Clean Text provides multiple levels of undo if you ever make a mistake or change your mind. You can also choose the font and size of text in the window, as well as the format for the inserted date and time. Even if text-cleaning is an infrequent task for you, Clean Text is a useful tool to keep on hand. And if you clean up text frequently, the program’s iconized mode is great for one-click text processing. Clean Text doesn’t have all the features or polish of TextSoap—which offers more cleaners, a systemwide menu, conditional actions, styled text, more-powerful searching, cleaning-action groups, and more—but for those who don’t need all those features, Clean Text’s lower price will make it appealing.